a) The pre tube uses the famous 12AU7,which is with wide frequency response,small distortion and strong driving.The voltage amplification of power amplifier uses tube 6SN7, and the current output adopts tube EL34.The high-voltage power supply of tube uses a constant current source resistance of high speed and low power supply and the VT consists of two high-current power tubes in parallel. The resistance is smaller, higher stability.Current supply is fast and it performs excellent. b) The input of the machine selects lossless relay control and volume using high-quality ALPS motor potentiometer.It also uses a variety of top components in the world for consoles, including the United States DALE resistors, Campbell KIMBER KAP (or U.S. Multicap) Top capacitance , CMC signal terminals, the German Weimaraner WIMA MKP10 (audio-specific) capacitors, expensive five-star single crystal copper wire of BADA and high capacitors of Philips and SOLEN. 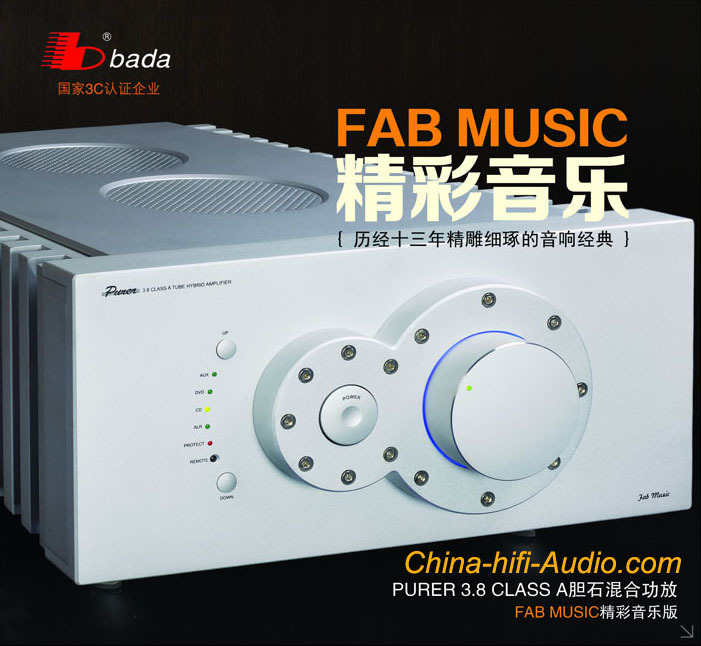 c) Usable as a pure pre-amplifier, output stage or full-amplifier the unit offers you an uncomparable flexibility. Because of the mono block construction each channel has got a transformer with an enormous power. The Purer 3.8 with a pre-amplifier together with a miniature military tube per channel, a 12AU7-tube and a transistor power amplifier with 12 transistors. Beside the XLR- input are existing 3 cinch connectors.